Both overt hypothyroidism as well as minor elevations of serum thyrotropin (TSH) levels associated with thyroid hormones within their respective reference ranges (termed subclinical hypothyroidism) are relatively common in older individuals. There is growing evidence that treatment of subclinical hypothyroidism may not be beneficial, particularly in an older person. These findings are relevant at a time when treatment with thyroid hormones is increasing and more than 10–15% of people aged over 80 years are prescribed levothyroxine replacement therapy. The prevalence of hypothyroidism increases with age. However, the reference range for TSH also rises with age, as the population distribution of TSH concentration progressively rises with age. Furthermore, there is evidence to suggest that minor TSH elevations are not associated with important outcomes such as impaired quality of life, symptoms, cognition, cardiovascular events and mortality in older individuals. There is also evidence that treatment of mild subclinical hypothyroidism may not benefit quality of life and/or symptoms in older people. It is unknown whether treatment targets should be reset depending on the age of the patient. It is likely that some older patients with non-specific symptoms and incidental mild subclinical hypothyroidism may be treated with thyroid hormones and could potentially be harmed as a result. This article reviews the current literature pertaining to hypothyroidism with a special emphasis on the older individual and assesses the risk/benefit impact of contemporary management on outcomes in this age group. Current evidence suggests that threshold for treating mild subclinical hypothyroidism in older people should be high. It is reasonable to aim for a higher TSH target in treated older hypothyroid patients as their thyroid hormone requirements may be lower. In addition, age-appropriate TSH reference ranges should be considered in the diagnostic pathway of identifying individuals at risk of developing hypothyroidism. Appropriately designed and powered randomised controlled trials are required to confirm risk/benefit of treatment of subclinical hypothyroidism in older people. Until the results of such RCTs are available to guide clinical management international guidelines should be followed that advocate a conservative policy in the management of mild subclinical hypothyroidism in older individuals. The population of the world is ageing. In the United Kingdom, nearly one in seven people is projected to be aged over 75 years by the year 2040. However, increases in health life expectancy measured at 65 and 85 are not keeping pace with improvements in numerical life expectancy. This suggests that real health improvements are being experienced by younger people, and that people over 65 years of age are spending more time in ill-health. Therefore, unless this trend can be reversed, a major challenge for an ageing population is likely to be an increasing prevalence of the health conditions associated with old age such as dementia, type 2 diabetes mellitus and cardiac diseases. Apart from the effects on individuals and their families, this demographic change will have major socioeconomic and political implications. Thyroid hormones have a major influence on all major organs/systems and adequate levels are important for optimal function. Thyroid dysfunction is a common condition that affects between 3 and 21% of the population with prevalence being more common in women and in older individuals. In the UK, it is estimated that hypothyroidism treated with levothyroxine may affect nearly 800,000 older individuals aged more than 70 years. The clinical presentation of thyroid dysfunction is non-specific and often variable; therefore, the diagnosis of thyroid dysfunction is based primarily on biochemical abnormalities. The pituitary hormone thyrotropin (TSH) has a complex inverse relationship with the thyroid hormones thyroxine (T4) and tri-iodothyronine (T3). A negative feedback mechanism exists between TSH and thyroid hormones, which means that TSH levels are the most sensitive marker of thyroid status in an individual. Accordingly, overt hypothyroidism is defined as serum TSH concentrations above the reference range with low free T4 levels, while subclinical hypothyroidism is diagnosed when TSH levels are high and circulating free T4 is normal. The relationship between TSH and thyroid hormones is influenced by a number of factors including age, smoking and thyroid peroxidase antibody status. Recent data from observational studies suggest that serum TSH levels increase in older people. Thus, very mild TSH elevations in older individuals may not reflect subclinical thyroid dysfunction but rather be a normal consequence of ageing. Besides, serum TSH levels are also influenced by genetic, environmental, clinical and therapeutic factors and agents, as well as trends in clinical practice . 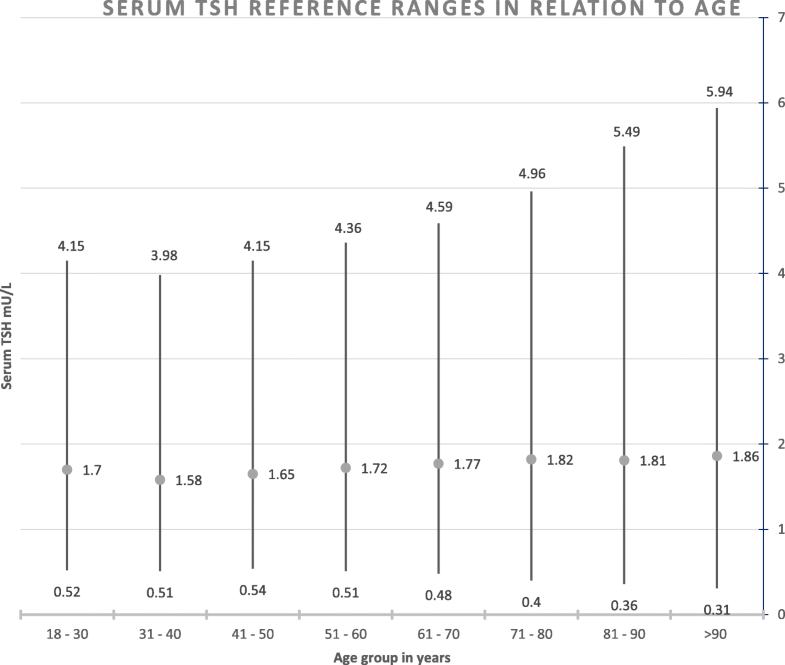 Despite this, adult patients are often managed similarly utilising a uniform serum TSH reference range (usually 0.4–4.5 mU/L) and age-specific ranges are not in routine clinical use. In addition, thyroid hormone requirements change with age and older patients on replacement therapy are more susceptible to the effects of thyroid hormone excess such as osteoporosis and atrial fibrillation. Therefore, careful consideration is required in the interpretation of thyroid function test results as well as in managing thyroid disease in the older population. The interest in thyroid function in the elderly has been increasing with the recognition that thyroid status is may be linked to disability, cognitive function, cardiovascular disease risk and longevity. This review describes the prevalence of hypothyroidism in the older population and outlines the effects of treatment in this age group. As the TSH distribution and the reference limits shift to higher concentrations with age, the prevalence of subclinical hypothyroidism may be overestimated. Employing a uniform TSH reference range across all age groups in the NHANES study led to approximately 70% of older individuals with a slightly high serum TSH being incorrectly classed as having subclinical hypothyroidism. An analysis of TSH results from one pathology centre in Western Australia however concluded that the use of age-specific TSH reference ranges has minimal impact on reclassifying thyroid status except in the very old (85 years), in whom 2–4.7% were reclassified as being euthyroid. The reference ranges for TSH are discussed in the next section in more detail. The American National Academy of Clinical Biochemistry formulated guidelines in 2003 which state that “TSH reference intervals should be established from the 95% confidence limits of the log-transformed values of at least 120 rigorously screened normal euthyroid volunteers who have: (a) No detectable thyroid autoantibodies, TPOAb or TgAb (measured by sensitive immunoassay); (b) No personal or family history of thyroid dysfunction; (c) No visible or palpable goitre and, (c) Who are taking no medications except oestrogen”. In addition, TSH secretion has a diurnal variation with a peak late at night/early hours of morning, and, therefore, sample timing and shift work should also be considered when defining the TSH reference range. In the last few decades, the ability of the TSH assays to detect lower levels has improved with each generation and therefore the present lower euthyroid reference limit is set at 0.3–0.5 mU/L. This has resulted in subclinical hyperthyroidism being diagnosed with much greater precision, irrespective of the population being studied or the method used. In contrast, the upper (97.5 percentile) reference limit for nonpregnant adults is still not universally agreed. [30, 31] As a consequence, the diagnosis of subclinical hypothyroidism is still very much dependent on the value at which the upper limit of TSH is set. The most robust data determining the TSH reference range was obtained from the US National Health and Nutritional Examination Survey (NHANES) III study. This large study (n = 16,088), designed to be representative of the US general population, analysed the median and lower and upper reference limits of serum TSH in carefully selected euthyroid individuals using current immunoassays. This study concluded that establishing an accurate TSH upper limit at an individual level from population data is not possible, as TSH has a low individuality index (the ratio between the within- and between-person variability). The overall reference range was deemed to be 0.4–4.1 U/L but there were significant differences between age groups and races. For example, the upper limit of TSH was 3.5 mU/L in the 20–29-year olds but increased to 7.9 mU/L in the 80+ year group. Similarly, the upper TSH level was 4.2 mU/L in White people whereas it was 3.4 mU/L in Black people. Similar data obtained from a Scottish laboratory database confirms an age-related increase in the upper reference limit for serum TSH). An illustration of age-specific TSH reference ranges are described in the Fig. 1. Serum TSH is not normally distributed and has a skew to the right. However, more than 95% of healthy euthyroid individuals have serum TSH values between 0.4 and 2.5 mU/L. It is therefore argued that TSH values > 2.5 mU/L reflect underlying autoimmune thyroid disease and contribute to the skewed TSH distribution curve,  a view further supported by the fact that such individuals have a higher risk of progression to subsequent hypothyroidism. [39, 40] The opposing argument to retain the upper limit of the TSH reference range around the 4.0–5.0 mU/L mark is that reducing the upper TSH reference limit would lead to a vast increase in the number of people diagnosed with subclinical hypothyroidism without any evidence-based justification or proof of benefits of treatment. This issue is complicated by the concern that current TSH immunoassays differ in specificity for recognizing circulating TSH isoforms and that this can give rise to a full 1.0 mU/L difference in TSH values reported by different assays. In summary, the current upper limit of the serum TSH reference range in older people does not reflect age-related changes and leads to the over-diagnosis of hypothyroidism and, consequentially, the probable unnecessary treatment of an unknown number of people with thyroid hormones. The adoption of a universal TSH range across all adult age groups on an individual’s health have not been tested in prospective trials, and unnecessary treatment will lead to a higher health and economic burden. In addition, a slightly higher serum TSH level may be normal in older individuals and not associated with worse outcomes. [18, 33] This has implications for diagnosing subclinical hypothyroidism in the elderly and also the level of serum TSH to aim for in treated hypothyroid patients in this age group. Therefore, it has been suggested that age-specific reference limits should be utilised instead. However, further research is required before age-specific TSH reference ranges become part of routine clinical practice. Thyroid hormones have an inotropic effect on cardiac muscle. Accordingly, some studies have shown a positive association between hypothyroidism and heart failure. An individual participant data meta-analysis of 25,390 participants revealed that both low as well as high serum TSH levels. In stratified analysis, there was a trend towards lower risk of heart failure in older individuals with subclinical hypothyroidism although this did not reach statistical significance. In a longitudinal analysis of participants from the Rotterdam study, the risk of sudden cardiac death was found to be higher with higher FT4 levels, even within the reference range. In age-stratified analysis, the risk of sudden cardiac death appeared to be particularly higher in older individuals (> 65 years) with higher FT4 levels or lower TSH concentrations. In subclinical hypothyroidism, a number of studies have shown association with adverse cognitive function in younger individuals, [66–68] but results in older people have been conflicting. One study in individuals with a mean age of 74 years showed that people with subclinical hypothyroidism had worse performance on verbal recall and cognitive scores but working memory and processing speed were unaffected. The PAQUID survey of individuals aged 65 years or more showed that increased TSH levels were significantly linked with the presence of symptoms of depression but not with impairment of cognitive function. There have been other studies which do not support any association between subclinical hypothyroidism and cognitive impairment. [20, 62, 71, 72] The InCHIANTI study found a significant association between subclinical hyperthyroidism and cognitive impairment as assessed by the mini-mental state examination, but no such association with subclinical hypothyroidism. A prospective observational study within the Leiden 85+ cohort, which followed up a total of 599 patients from the age of 85 to 89 years for a mean period of 3.7 years, found no significant association between thyroid dysfunction and either depression or cognitive impairment. This was a large and appropriately powered study, and the authors argue that in this very elderly cohort, whilst depression, dementia and thyroid dysfunction are all relatively common, the relationship appears coincidental rather than causal. In contrast, in a notably younger cohort of predominantly euthyroid patients aged 49–71 years, a higher TSH level was associated with poorer performance in tests of memory. Amongst the many as-yet unanswered questions about the relationship between thyroid status and cognitive ability, includes the possibility that the nature of this relationship changes with the aging process. In summary, there is little evidence in the literature to clearly link overt hypothyroidism with reduced mobility or increased frailty, and in subclinical hypothyroidism there is some published data suggestive of improvements in these domains compared to euthyroid individuals, although the data is conflicting here. The dose of levothyroxine that normalises serum TSH level is lower in older patients due to changes in thyroxine turnover with age related reduction in lean body mass. Other factors such as decreased absorption, concomitant medication use, and other comorbidities could also affect thyroid hormone metabolism. The elderly are more susceptible to the ill-effects of thyroid hormone excess such as AF,  and osteoporotic fractures. [91, 92] Therefore, careful adjustments of levothyroxine dose at regular intervals are required in this population to avoid iatrogenic hyperthyroidism. The largest study to date of 12 months of levothyroxine treatment in subclinical hypothyroidism in older persons concluded that there was no benefit of treatment on quality of life or symptoms. This double-blind, randomised, placebo-controlled trial of 737 patients older than 65 years with subclinical hypothyroidism demonstrated no significant improvement in the 100-point ThyPRO score (Thyroid-Related Quality of Life Patient-Reported Outcome) with low-dose levothyroxine treatment. Therefore, in addition to the lower dose requirements related to thyroxine metabolism, based on the current evidence, it is reasonable to raise the target serum TSH up to 6 or 7 mU/L in persons greater than age 70–80 years particularly if they are at risk of cardiac arrhythmias or osteoporotic fractures. Thyroid hormones have an essential role in the functioning of nearly all tissues in the body at all stages. Thyroid function changes with age and these alterations are more pronounced at both ends of the life span. Current evidence suggests that a slight lowering of thyroid function in older individuals, as evidenced by a marginally raised serum TSH and low normal FT4, may not be associated with an adverse outcome and may, in fact, be beneficial. On the other hand, high thyroid function, as evidenced by a low TSH level needs careful monitoring and treatment considered if there is evidence of end-organ damage (such as osteoporosis or AF), or if serum TSH is suppressed. Despite major advances in our understanding of thyroid function and ecology, mainly due to improvements in assay techniques and high-quality epidemiological studies, several unresolved issues remain. It is currently unclear what the precise underlying mechanisms are behind the changes in thyroid function that are observed in older individuals. Moreover, it is uncertain whether these changes are part of healthy aging or are a bio-marker of underlying disease. More research is required to fully understand why thyroid function changes in older individuals and whether modulation of thyroid hormones is advantageous for healthy aging and longevity. Mild thyroid hormone deficiency (or subclinical hypothyroidism) is more common in the elderly. But, if it is ‘normal’ and indeed desirable to have a slightly low thyroid function in older people then the current use of uniform reference ranges across all adult ages may need to be revised. Age-specific reference ranges may be required to diagnose thyroid disease with special reference to subclinical thyroid disease as well as to target serum TSH in patients on thyroid hormone replacement. And, in the future, it is possible that manipulation of thyroid function for health and longevity may be routinely practiced. This article was not funded by any specific sources. Data sharing is not applicable to this article as no datasets were generate or analysed during the current study. Both OL and SR contributed equally to the writing of this manuscript. Future of an Ageing Population https://www.ageing.ox.ac.uk/files/Future_of_Ageing_Report.pdf. Accessed 10 Dec 2018. Benseñor IM, Goulart AC, Lotufo PA, Menezes PR, Scazufca M. Prevalence of thyroid disorders among older people: results from the São Paulo Ageing & Health Study. Cad Saude Publica 2011;27:155–161. http://www.ncbi.nlm.nih.gov/pubmed/21340114. Accessed 2 Dec 2018. De Jongh RT, Lips P, Van Schoor NM, Deeg DJH, Vandenbroucke JP, Rijs KJ, et al. Endogenous subclinical thyroid disorders, physical and cognitive function, depression, and mortality in older individuals. Eur J Endocrinol. 2011;165:545–54. https://doi.org/10.1530/EJE-11-0430. Clarnette RM, Patterson CJ. Hypothyroidism: does treatment cure dementia? J Geriatr Psychiatry Neurol. 7:23–7. http://www.ncbi.nlm.nih.gov/pubmed/8192826. Accessed 6 Dec 2018. Razvi S, Korevaar T, Taylor P. Trends, determinants and associations of treated hypothyroidism in the United Kingdom, 2005 – 2014. Thyroid 2018;:thy.2018.0251. https://doi.org/10.1089/thy.2018.0251.